Stay wary, but tornado activity is low so far this year. I think winter finally took its leave, and we will probably see more severe weather now. It seems that tornadoes, or the lack of them, are back in the news at the moment. American Meteorological Society President, Dr Marshall Shepherd, seems to think it is unfair to mention low tornado numbers, saying it is an “abuse”. So I thought it worthwhile to take another look at the stats at the end of 2012. Good news for Oklahoma and the central states. We need to stay wary. Them twisters can be sneaky. In a blow to those that want to link increased severe weather with global warming/climate change, a new record low has been set according to NOAA tornado data. At the same time, it has been 2750 days (7 years, 6 months, 11 days) since the last major Hurricane (Cat 3 or greater) hit the USA on October 24th 2005 when hurricane Wilma made landfall. Each new day is a new record in this major hurricane drought. 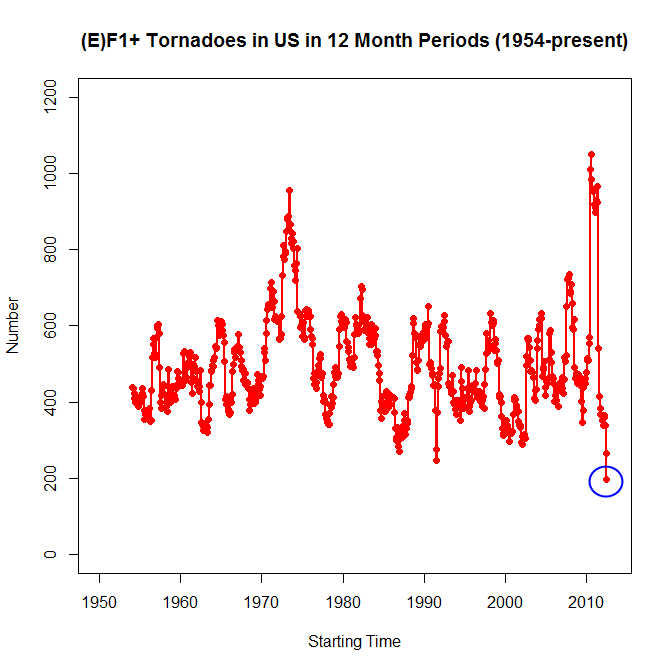 The 12-month period from May 2012 to April 2013 was remarkable for the absence of tornado activity and tornado impacts in the United States. John Brignell maintains a very long online list of things that are being blamed on global warming. Absurdities abound. In other words, global warming is analogous to a Rorschach test. Whatever reasons an individual provides for being concerned reveals far more about their own assumptions and preoccupations than it does about the climate.